Share responsibility for the maintenance tasks of a certain neighbourhood. The residents, members of a certain association (e.g. soccer team, dart players…) receive money from the municipality to complete some maintenance tasks. Make people aware of their direct environment and motivate them to take care of it. Of course, from the municipality’s viewpoint it is also useful to save money on the maintenance jobs. The whole idea of involvement of inhabitants came from the ‘thinker-panel’ (called the Denktank). This panel consists of a representatives of residents and municipality. They have monthly meetings where they share their ideas about how to improve the neighbourhood. The representative agency of residents together with the municipality organizes maintaining programs for the participating associations of residents. Hereby the required money for these events is given directly to these associations for their work, and the maintenance tasks in their neighbourhood are completed by them, not by paying the employees of official maintenance companies. The system already exists on a very elementary level, and it still has to be worked out. It is running only for a few months, the operation has just started in a small neighbourhood of the town. Heleen Claringbould and Martijn Kramer told us to have big ambitions in this project. 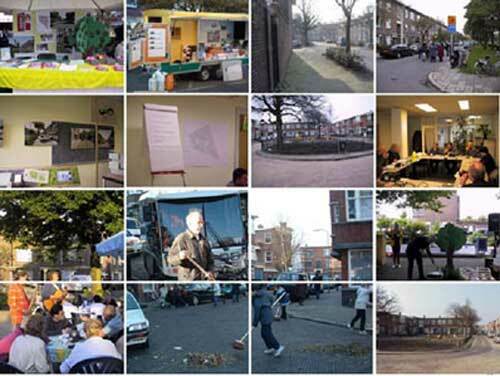 It is one of the first examples in the Netherlands that makes such an initiative on a local level. The project started at the beginning of year 2004. It involves just a corner of The Hague. The associations/clubs receive money from the municipality (from the maintenance budget) for completing the maintenance tasks in that particular neighbourhood. The tools they need to do these tasks with, they take care for by themselves but they are supported by the municipality. The society completes maintenance tasks for itself, learns how to value and take care of its own environment, so The Hague could become a good example for other cities, too. The project in practice will generate tended environment: gardens, streets, parks will be tidy. It promotes a healthier town. This system is going to save money for the town.